Joy Creek Photo Archive (c) all rights reserved Because of its mat-forming nature, we grow Thymus 'Pink Ripple' over a low wall. It has reached the base of the wall and forms a mat on the ground which we occasionally step on as we work. Of course, when we do so, we get a whiff of its aromatic leaves. 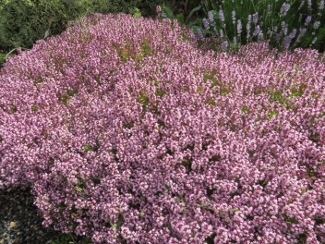 The cultivar name describes the masses of tiny pink flowers that cover this thyme in summer. When in bloom, it is the gathering place of many different types of bees. Though its foliage is semi-evergreen it needs to be cut back at the end of winter to promote new growth and to keep it looking fresh. Photo courtesy of Tamara Paulat.